Jorun (left) and Paul, CFCA sponsored youth in Kenya, play bano, which means marbles in Swahili. In the streets of Nairobi, Kenya, children gather to pass the time and to just be kids. 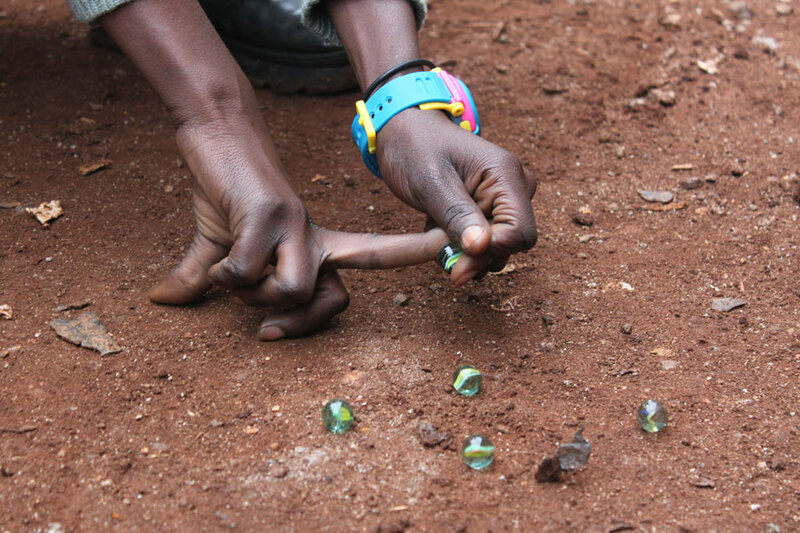 With bragging rights on the line, they pull marbles from their pockets and begin to play bano, which is Swahili for marbles. “The game is very interesting and I feel proud when I win,” said Paul a youth sponsored through CFCA. Bano, or marbles, can be played with two or more players. First a small hole is made in the dirt. The players begin to measure to determine the exact placement of their marble by putting their pinky finger near the hole, spreading their fingers wide and placing the marble next to their pointer finger. With another marble in hand and great concentration, the players begin to shoot in hopes of getting the most marbles into the hole and winning the game. 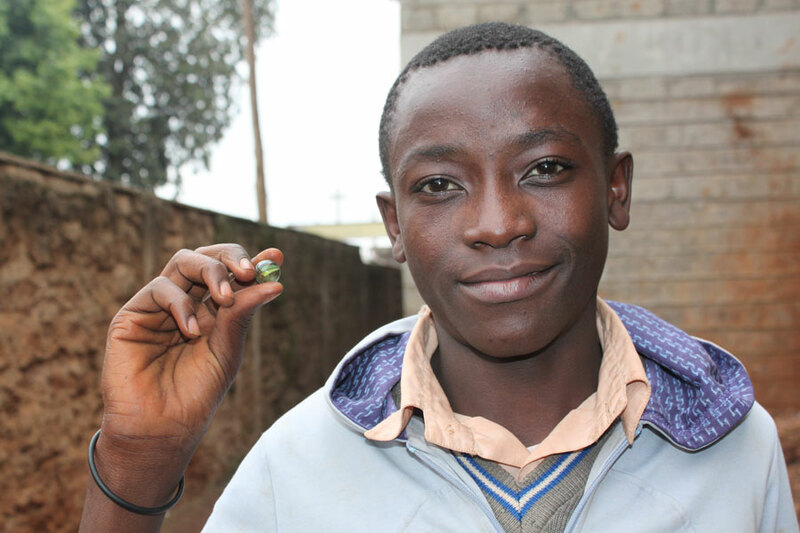 “Playing the game of marbles is a good break from schoolwork,” said Thomas, a sponsored youth in Kenya. A hole dug in the ground. A child plays bano in Kenya. 1. Start by making a small but deep hole in the ground. 2. Each player is given two marbles. One marble is placed on the ground, four spread-finger widths away from the hole. The other marble is kept in hand and used as a shooter. 3. The players take turns trying to hit the first marble with the shooter marble. Each player may shoot once per turn to try and hit the first marble into the hole. 4. A player scores a point when he or she hits the marble into the hole. Once the player hits his or her marble in the hole, he or she will try to hit another player’s marble into the hole on his or her next turn. 5. The more marbles a player can hit into the hole, the higher the chance of becoming the overall winner. 6. Once all the marbles are hit into the hole, the player with the most points at the end of the game is the winner. Amazing to see that even in this day and age, what children abroad spend their time playing with (the most basic of objects to occupy their time and young minds) versus what American children spend their time playing with (the most advanced of technological toys). Though I’d be willing to bet, that these children playing with the most basic and humble of toys have just as much fun with their toys.